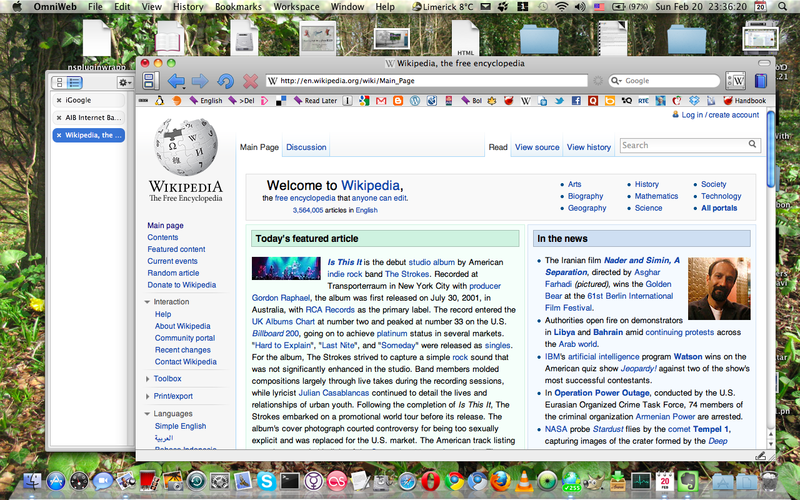 I like the OmniWeb browser that I've been using for a while on my MacBook. And this is despite it having a very serious rival as a great lightweight browser for the Mac in Stainless. A feature that I very much like in OmniWeb is the ability to have favicon-only bookmarks in the bookmarks bar to speed up browsing. However, the green checkmarks that almost obliterated the bookmarks, although they are supposed to indicate that the bookmarked page has changed since the last time I viewed it, were to me a discomfort. But, a quick post to the OmniWeb forum indicated that to get rid of them I only had to go to OmniWeb>>Preferences>>Bookmarks and change the Check Bookmarked pages for changes to Never.